Today we share with you a very interesting and exciting article. I was invited to participate in a unique quest only made by a couple of people here in the community of Loreto. 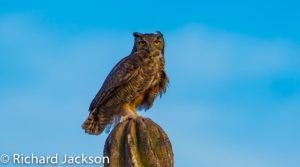 Two local residents, Richard Jackson and Tom Haglund, both amateur naturalists, and Richard a professional nature photographer. 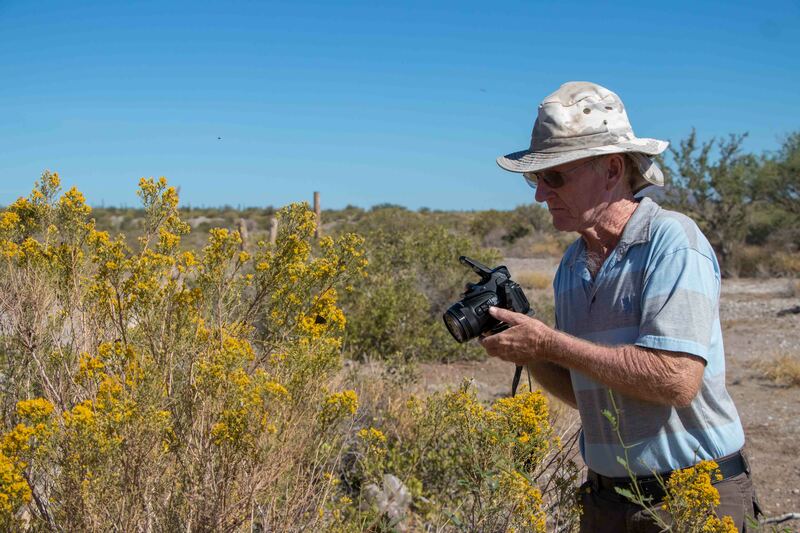 They spend much time exploring the wealth of plants and creatures of the area and capturing these natural treasures in photographs to share with the people of Loreto. 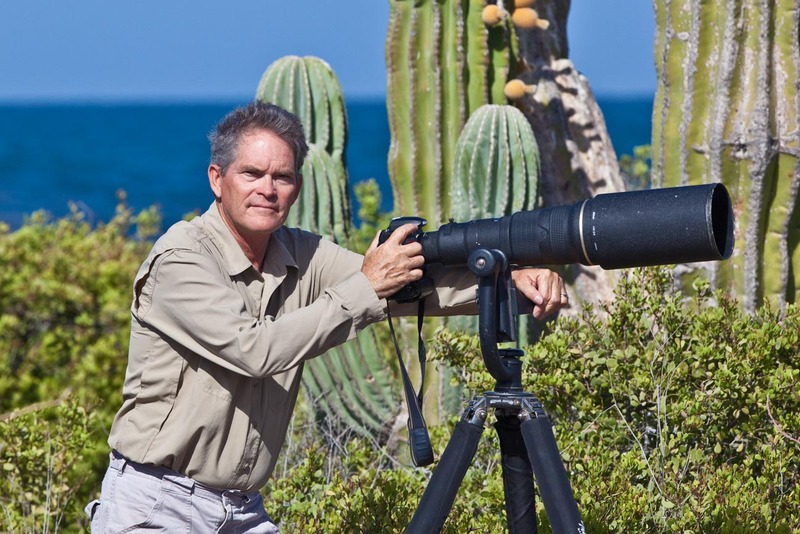 Richard brings back beautiful memories for the people of Loreto, beautiful and infinitely charming visual memories, usually with an educational slant, very professional photographs of wildlife in Loreto. 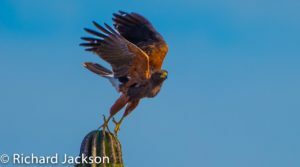 They kindly invited me to participate in a day of field work in the area of ​​photography and study of nests of species such as Crested Caracara (Caracara cheriway), Harris’s Hawk (Parabuteo unicinctus), and the Great Horned Owl ( Bubo virginianus ). 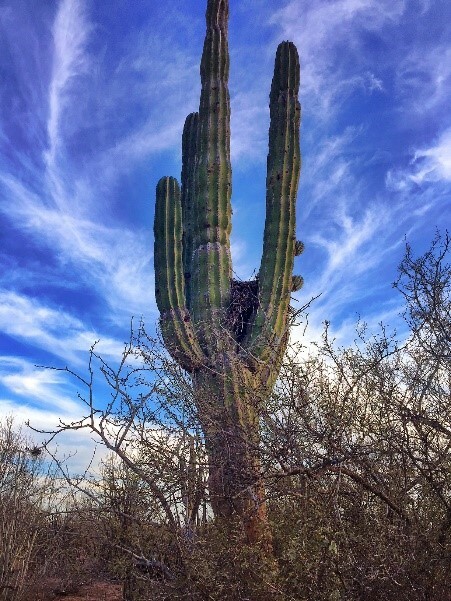 The invitation would definitely turn into a fun and exciting experience because of the large number of sightings of different birds and wildlife that the municipality of Loreto is blessed with. The outing amounted to 8 hours of incredible sightings; 8 enriching hours, 8 hours full of emotion, 8 hours of observing the work of these dedicated men. 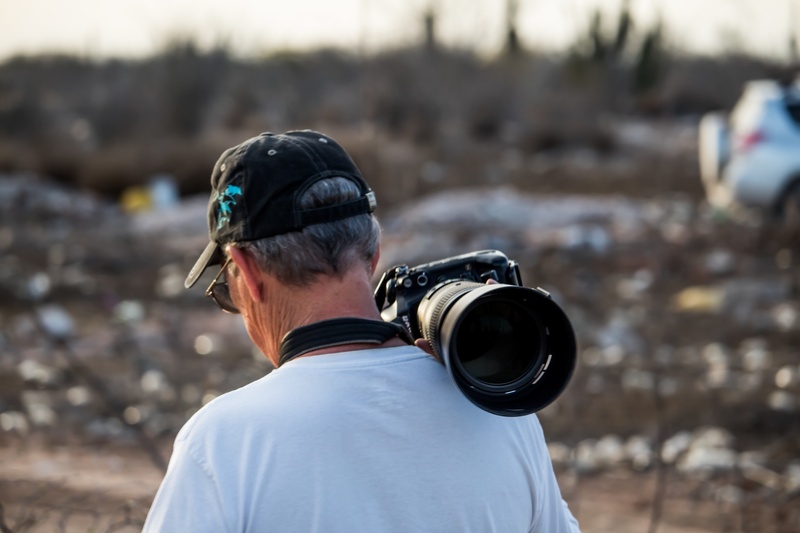 I now know that working closely with a wildlife photographer like Richard and a bird specialist like Tom, demands a lot of patience, passion, and above all, respect for the places visited. This is not an everyday outing, for that reason I am infinitely grateful for this invitation. We will not provide the exact locations because I want to take care of this natural environment and avoid invasive research or any damage to these species, but we brought some spectacular photos. A conversation with Richard and Tom about their experiences in their corresponding areas as we move is like a story that doesn’t end, capturing your attention and emotion with each detail, stories that only they can tell. 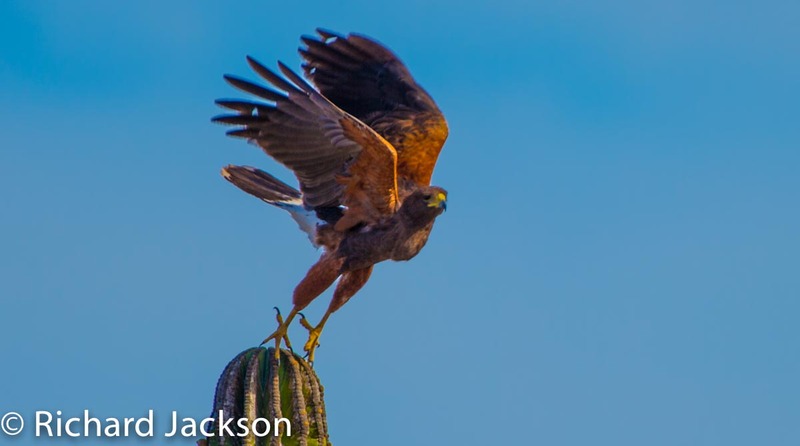 While this happened, Richard, with a sharp and experienced eye, made several sightings of nests. I could not perform such a feat with binoculars. I must conclude that he has an eagle eye. Sadly, these first few nests were empty. Maybe we arrived too late or too early, we did not know, but we continued in the search. 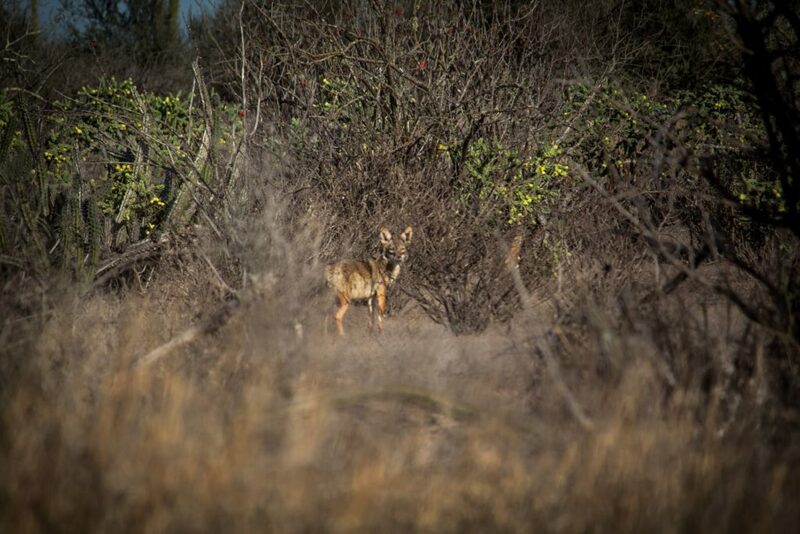 I managed to capture with the lens a Coyote walking along the dirt road we were on. 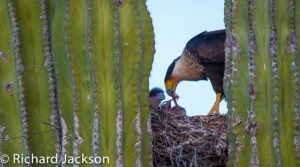 I was eager to see Richard and Tom work, and just past the Eighth Registered Nest, Tom saw a bird standing on the top of a Cardón cactus about 50 meters left of the road we were cruising. We quickly took up binoculars… Zaz! 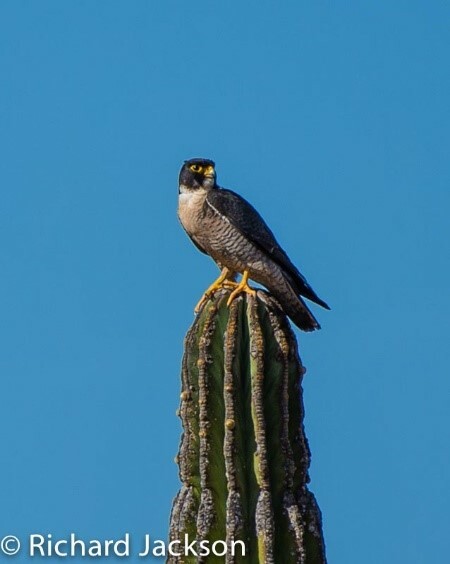 It was a beautiful Peregrine Falcon, watching the surrounding desert for prey while preening its feathers with its beak. The evening sun hit its face, giving life to those golden tones around its eyes. It was spectacular!… Quickly Richard acted by taking out a camera with a super lens that looked similar to a rocket launcher, with which he comfortably captured this beautiful image without leaving his seat. 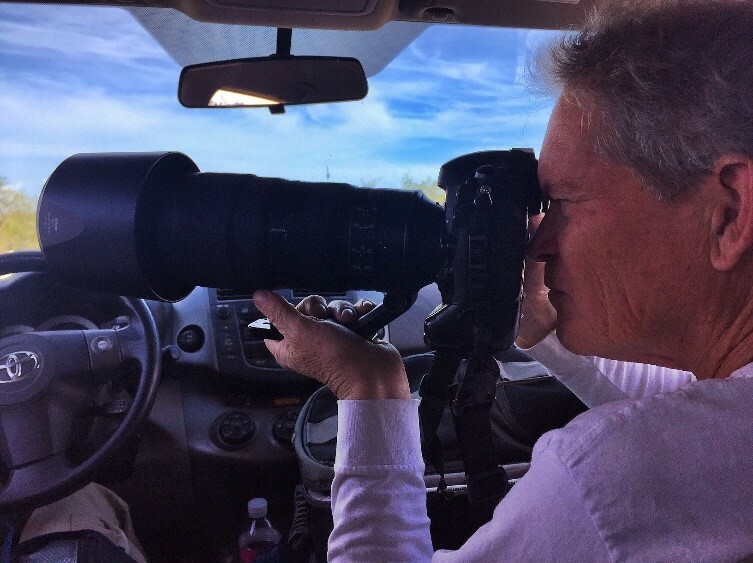 After a few minutes of watching the Peregrine, we drove on and this trip became a party of sightings where the seriousness and the professionalism of Richard taking pictures was very noticeable, while Tom gave important information about all the birds sighted. I felt like I was in the program, “You want to be a millionaire” with a lot of important data that enriched my environmental awareness of this incredible fauna. It was a tremendous rolling party, where we spotted; Crested Caracaras on several nests both with and without chicks, Harris’s Hawks on and off of nests, American Kestrels (Falco sparverius) at a nest hole in a Cardón, Red-tailed Hawk (Buteo jamaicencis) hunting, Northern Harrier (Circus cyaneus) hunting. We also saw and identified many other species of birds. 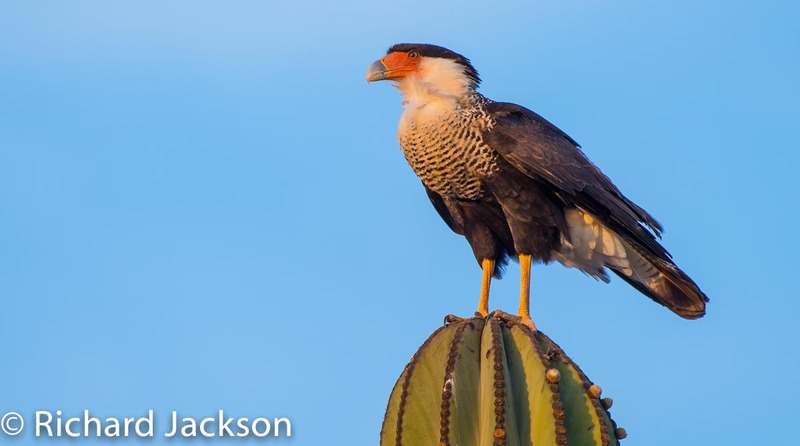 We were able to observe the active nest of a Crested Caracara, an image that said more than a thousand words. 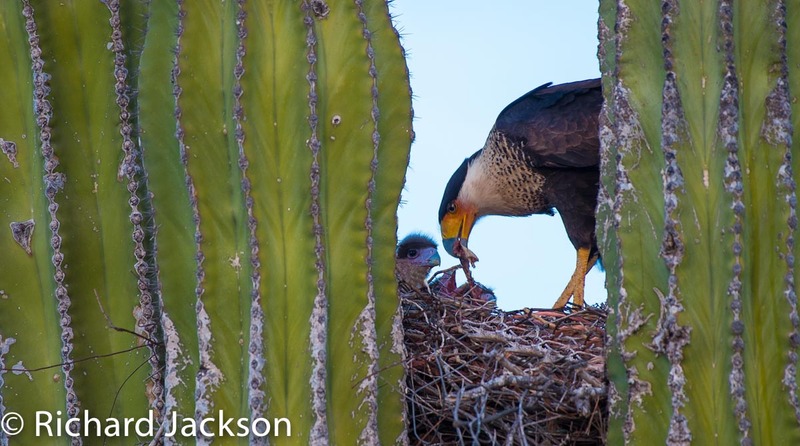 The nest was wedged between the columns of a Cardón with a bird approximately 40 cm in height sitting in it, watching us in a curious, vigilant manner and most attentive to our movements in the car. What a photo! An active Great Horned Owl nest with two chicks in it was our next stop. This particular nest has been on Richard and Toms “radar” for several years now and has been occupied by Owls three years and Harris’s Hawks another two. 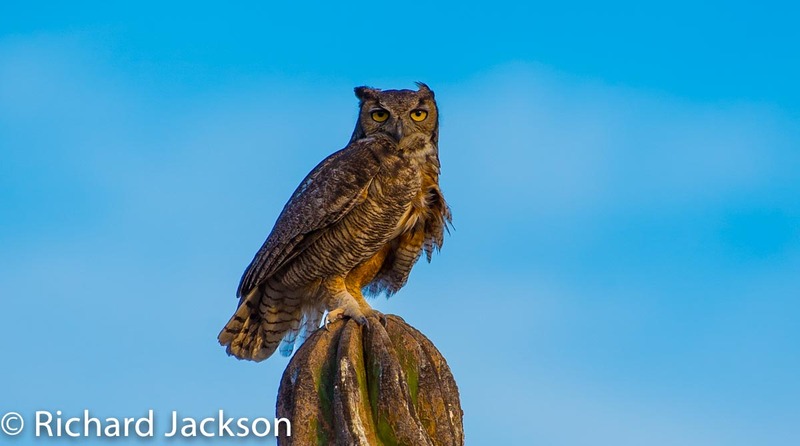 The Great Horned owl is no nest builder, it will take over a raptor’s nest. This doesn’t necessitate the approval of the owner. 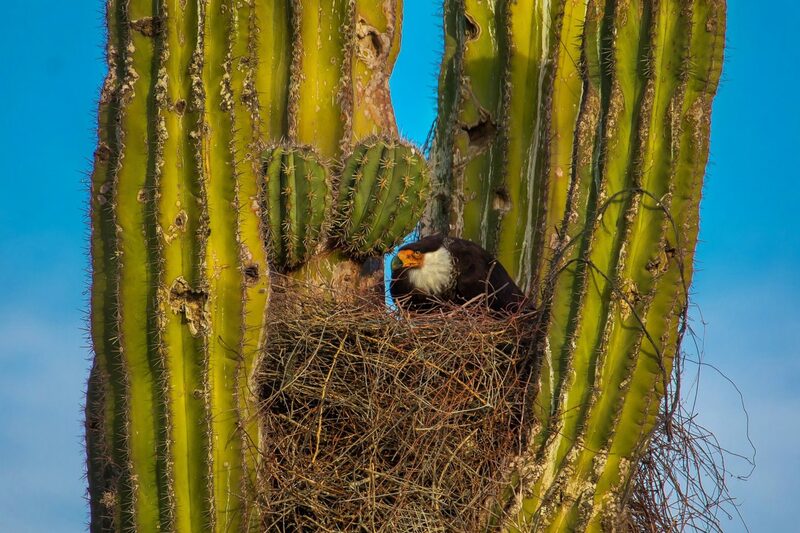 The two chicks in this nest were old enough to be moving around and looking out at their surroundings. After they start flying, they will remain in the area and be cared for by the parents until ready to strike out on their own. The mother and the chicks looked back at us, that binocular look characterized in the owls, hypnotizing and intense. It reminded me of that Mexican belief that when an owl looks you directly in the eyes it is because it is providing you with intuitive power. Intuitive looks! The night had arrived and everything had been spectacular on the trip, but we did not know that Richard was also a good magician and had another “Ace” under his hat, before leaving this area and returning home , Richard and his accomplice Tom, they gave a demonstration of why they are experts in this area, Richard, halfway down the dirt road where we were played an electronic Jackrabbit distress scream and we counted around 5 Coyotes in the gloom. Well, maybe one was a Fox, it was our debate, but the amazing thing was the quick way to have coyotes around the car. Good job Richard! During this trip Richard said something I will not forget; when I questioned him about how he could be so good in this area, he answered, “Because it’s my job.” That made me think it’s not just his job, it’s that passion for nature that one day should be part of us all. I am very happy for this adventure with two great friends, characters admired in Loreto and faithful to their passion for the conservation of these species. They spend much of their time in bringing to us knowledge of the great natural treasure that is where we live and of the incredible wildlife that I’ve just had the privilege of visiting. PS No animal was hurt in the call of the Coyotes.